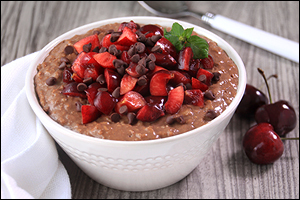 In a nonstick pot, combine oats, cocoa powder, cinnamon, salt, and almond milk. Mix in 1 cup water. If you like, add almond extract. Bring to a boil, and then reduce to a simmer. Transfer to a medium bowl, and stir in sweetener. Let cool until thickened. Top with cherries and chocolate chips. HG Heads-Up: If using frozen cherries, make sure no sweetener has been added. Fans of lemon bars will FLIP for this breakfast bowl... The coconut and blueberries take it over the top! 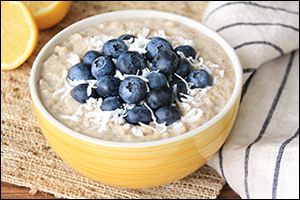 In a nonstick pot, combine oats, lemon juice, lemon zest, coconut extract, cinnamon, salt, and almond milk. Top with blueberries and shredded coconut. HG Heads-Up: If using frozen blueberries, make sure no sweetener has been added. Think about it. Your pal might end up having something lame for breakfast tomorrow. You can prevent it -- click "Send to a Friend" now.